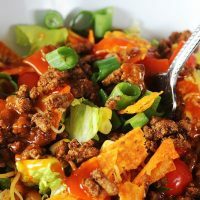 This Dorito Taco Salad is a Taco Tuesday dish that is simple and easy, can be made ahead, and served as a side or main meal. With school being back in and life getting seemingly busier (which really when is it not busy? ), my go-to favs are those recipes that can be made in under thirty minutes. And they get bonus points if they can be made ahead. I totally look like I have my stuff all the way together when my family gets home at the end of the day and dinner is already done. While I try to actually have my ish together and not just look like it, sometimes momma is faking it until she makes it yall. And if you can relate this recipe is totally for you. We can fake it together. LOL. What Goes In Dorito Taco Salad? 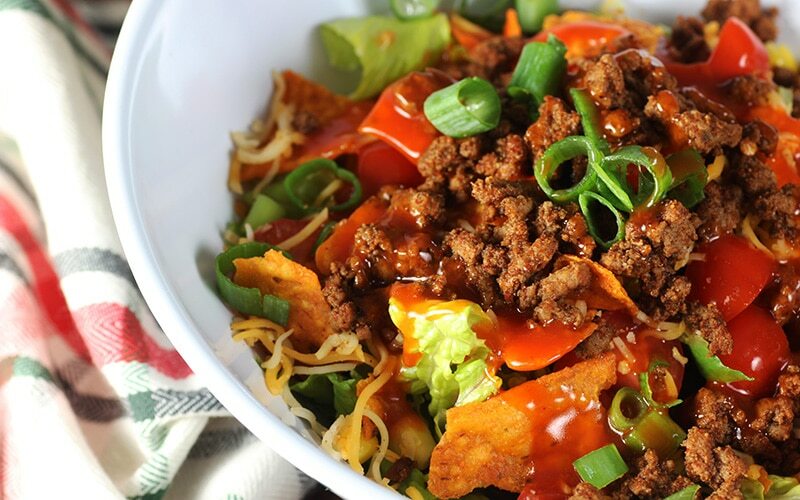 What Is The Best Dressing For Dorito Taco Salad? I personally use French dressing for my taco salad. I have seen it done with Catalina as well. By-and-large I am an Aldi Shopper. They don’t have Catalina, so French it is! And it is delicious. If you like prefer Catalina, I think it would taste amazing too! Basically, do you boo! Here is what I mean. I am currently on Weight Watchers, many of the ingredients are zero points which end up making it a low point meal for me. BUT that doesn’t automatically translate to healthy. Many vegetables are zero points. But I am willing to bet if you ate a whole pot of vegetables, you probably have done the equivalent damage of eating meat. So you could have just had that steak. I have found that moderation is what is healthy. No matter what you eat, you have to moderate it. For this recipe, you can choose to make your own taco seasoning (like I do and it's soooo easy). Or you can buy a taco seasoning packet. Set meat aside. 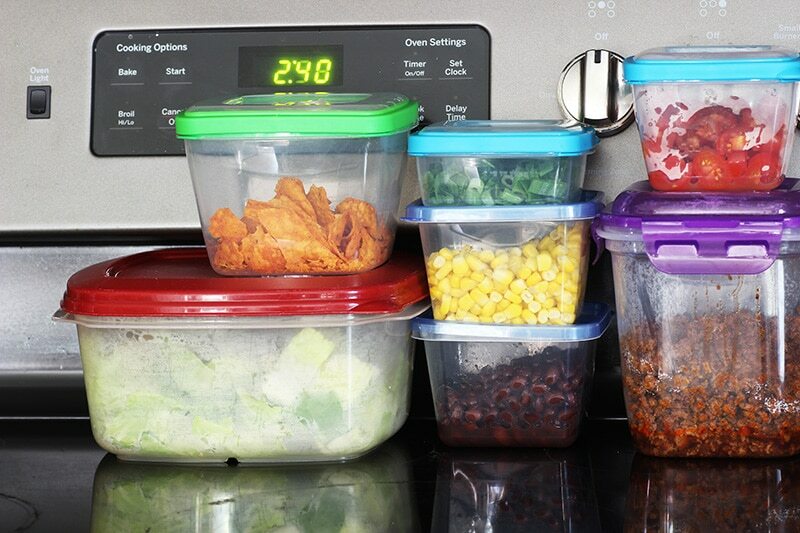 Rinse and shread lettuce, dice grean onions, and rinse and drain canned vegetables. Starting with lettuce, layer vegetables in large bowl, topping with meat and cheese. Toss with dressing. Serve and Enjoy! To use Homemade Taco Seasoning, add 3 Tbsp and 2/3 cup of water. Simmer until liquid is thickened. *can also dice 1 cup fresh tomatoes. 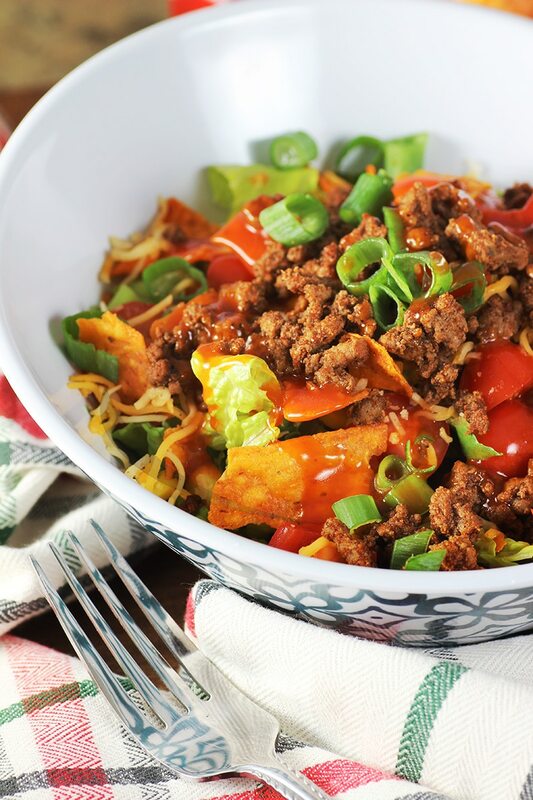 Interested In Making Dorito Taco Salad Later? Pin It To Your Favorite Board Using The Buttons Below.